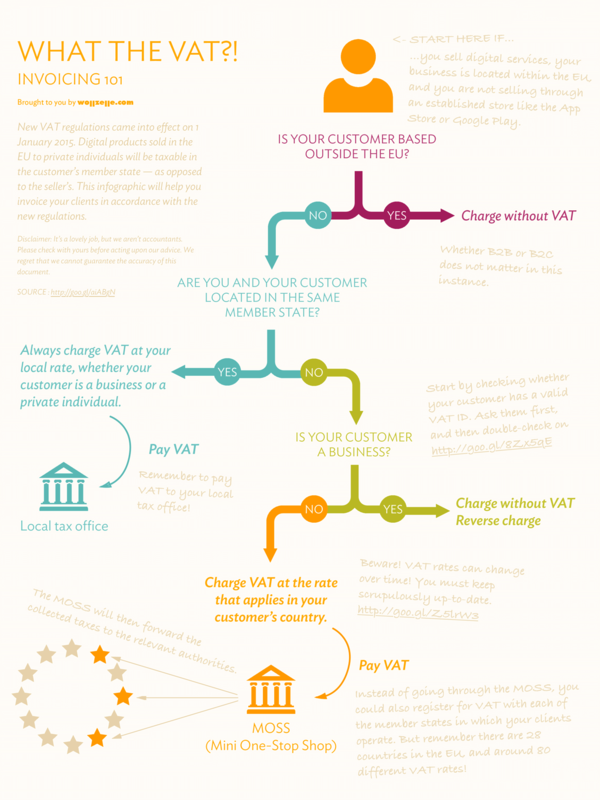 New VAT regulations came into effect on 1 January 2015. If you sell digital goods or services (Saas) within the European Union, it is essential that you review your invoices for compliance. As so often, the rules are confusing, and failure to conform could have dire consequences. There is so much contradictory information out there, especially for intra-European relationships, that I decided to put together a little flowchart, to facilitate our invoicing. Our friends saw it, liked it, and asked for it, so there it is, for your personal enjoyment. We hope it helps you get back to actual productive work as soon as possible! These new VAT regulations are a vast and complex issue. While nothing could replace the personal advice of your accountant, we have compiled a list of links, ranging from official texts to pithy commentary. May they prove as useful to you in your research as they were to us! We wish you the best of luck in this endeavour! Head over to our post on Facebook for additional comments.